Last week, NPR Counter-terrorism Correspondent Dina Temple Raston speculated that the Boston Marathon bombing was the work of domestic right-wing extremists because of the timing. Here is the story and video courtesy of viralfeed. In her segment, she notes that Hitler’s birthday and the anniversaries of the Columbine attack, the Oklahoma City bombing and the assault on the Branch-Davidian compound in Waco, TX all fall in April. I think I can honestly say that there is no one in the United States would could even remotely be considered conservative or right wing who celebrate Hitler’s birthday or the anniversaries of the shooting at Columbine or the Oklahoma City bombing. On the other hand, liberals celebrate the birthday of Vladimir Lenin, the Russian Communist dictator and mass murderer every year on Earth Day. When Jamie Glazov’s dissident parents escaped from the Soviet Union and immigrated to America, they were surprised to discover that American intellectuals were hostile to them. These leftists opposed their attempts to tell their stories about the continuing oppression of the Soviet government. The leftists opposed their own country and longed for its defeat while supporting every mass murdering dictator, no matter how vile. Growing up, Glazov had to wonder why these people could be so opposed to freedom. Why do progressives who profess to care about equality, civil rights, social justice, and who endlessly criticize the West, and particularly the United States for not abiding by their high standards, ignore the worst violations of the most basic concepts of human rights by totalitarian regimes abroad? Perhaps they are taken in by these governments’ propaganda. The Soviet Union, People’s Republic of China., Fidel Castro’s Cuba and others have all tried to persuade the world that they are utopias of freedom and plenty. Yet, the truth about all of these regimes has been readily available to any who have cared to look. Why then have progressives never bothered to look. Even worse, why when they have visited such miserable hellholes of tyranny and poverty have they never looked beyond the guided tours furnished by government agents to see the truth about the countries they are visiting? More recently, progressives have supported movements that have made no pretense of supporting modern concepts of human rights. I am referring, of course, to the contemporary trend among progressives to support Islamic fascists and terrorists. These people are perhaps the least progressive people in the world, with seventh century ideas about religious tolerance and gender relations, yet progressives who support feminism and gay marriage fully support people who stone homosexuals and compel women to cover themselves. Why? 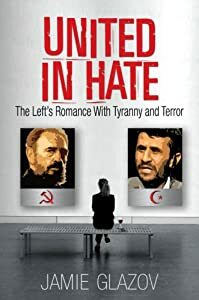 Jamie Glazov has an answer in his book United in Hate. He describes people of the left (Not necessarily liberals, liberals such as Harry Truman and Hubert Humphrey, not to mention John F Kennedy were dedicated to the cause of defeating the tyranny of the Communists) as people who have become profoundly alienated from their own society. These people seek to submerge themselves into a great cause, to extinguish their own individuality, which has only caused them pain, into a collective whole. It is not themselves that is at fault for their alienation, it is the greater society in which they live. Therefore, they seek to identify with the victims, real or imagined, of that society and develop apocalyptic fantasies of destroying it to make a better world. The details of that better world are seldom developed in detail. It is the destruction that appeals to them. This explains, according to Glazov, the progressive fondness for mass murderers. They are attracted to power and nowhere is power more manifested than in the destruction of millions of human beings. Moreover, mass death and destruction suited their apocalyptic worldview. Radicals adored the Soviet Union of Stalin or the China of Mao. They have had considerably less fondness for their more moderate successors. Stalin and Mao are preferable to Brezhnev and Deng Xiaoping precisely because the former were mass murderers and the latter were not. This leads then to the progressive support of radical Islam. Not only are Islamic terrorists enemies of the West and share a common enemy with the Progressives, but Islam can be, like Communism and Fascism a totalizing political ideology in which individuals are completely subordinated to the state, or in Islam’s case the ummah or worldwide religious community of Islam. It is noteworthy that the progressives have little use or support for more moderate or liberal interpretations of Islam. Then in addition, like Christianity and, to a considerably lesser extent Judaism, Islam has an apocalyptic tradition that appeals to the progressive. I have only scratched the surface of Jamie Glazov’s thesis and have hardly mentioned his detailed accounts of the progressive support of various Communist regimes. I strongly encourage anyone to read this book and learn why progressives seem to always support the cause of tyranny and death. The Association of Teacher Educators has recruited Chicago professor – and former domestic terrorist – William Ayers to speak at their the 2013 Annual Meeting in Atlanta, Georgia which will be held next month. William Ayers, a co-founder of the radical Weather Underground domestic terror group, was a key figure during the 2008 presidential campaign due to his Chicago ties to then-Senator Obama. The organization’s executive director, David Ritchey, confirmed that Ayers would be a keynote speaker at the conference although he admitted that he wasn’t involved in the selection process. At some point, Ayers realized that it was not possible to overthrow the government by bombing buildings. Instead, he decided to brainwash young people, hence his work in education. The fact that he has had some influence of primary school education in the United States is frightening. The fact that he and his wife Bernardine Dohrn are not serving life sentence in prison is infuriating. I feel like I am in Bizarro world. What is the Association of Teacher Educators anyway? Their website gives an explanation. The Association of Teacher Educators was founded in 1920 and is the only national, individual membership organization devoted solely to the improvement of teacher education for both school and campus-based teacher educators. ATE members represent over 650 colleges and universities, 500 major school systems, and the majority of the state departments of education. The ATE office is located in the Washington, DC area where it represents its members’ interests before governmental agencies and educational organizations. In addition, ATE has two voting seats on the National Council for Accreditation of Teacher Education and has representation on the ERIC Clearinghouse on Teacher Education. ATE’s representational form of governance offers ATE members an unusually high level of opportunity for national leadership. I could be wrong, but something tells me that William Ayers and his radical views are not that controversial with these people. I’m sorry, but it’s all I can think of right now, so I’ll just highlight a few stories that caught my eye. Obama doesn’t seem to have gotten any bounce in his approval ratings. While the public lauds the president’s performance killing Bin Laden, he got no overall bounce in a new Newsweek/Daily Beast poll. Also: Obama vs. Bush on terror and Obama vs. Trump in 2012. How much overall boost did President Obama get from the capture of Osama Bin Laden? None, according to an exclusive Newsweek / Daily Beast poll encompassing 1,200 American adults, conducted in the two days immediately before the president’s Sunday announcement about the terrorist leader, and then the two days immediately after. Specifically, Americans like the way he handled the situation, giving him strong results in strength and decision-making (55 percent now term him a strong leader overall, and 63 percent do so in the area of terrorism). Yet he did not get any overall bump in terms of approval rating, or electoral support. His approval rate was unchanged—48 approve, 49 disapprove, both before and after. There was also no statistical change in whether Obama deserves reelection—40/48 before, 39/49 after. This doesn’t seem quite fair for Obama. If the mission had failed he would have gotten blamed by everyone, s0 it’s only fair to give him some credit now. But, as the article mentions, people are probably more fixated on the poor economy right now. Was Bin Laden’s Killing Legal? GENEVA, May 3 (Reuters) – The United Nations’ top human rights official called on the United States on Tuesday to give the U.N. details about Osama bin Laden’s killing and said that all counter-terrorism operations must respect international law. But Navi Pillay, U.N. High Commissioner for Human Rights, said that the al Qaeda leader, killed in a U.S. operation in Pakistan, had committed crimes against humanity as self-confessed mastermind of “the most appalling acts of terrorism”, including the Sept. 11, 2001 attacks on America. “This was a complex operation and it would be helpful if we knew the precise facts surrounding his killing. The United Nations has consistently emphasised that all counter-terrorism acts must respect international law,” Pillay said in a statement issued in response to a Reuters request. Is that some kind of joke? The UN has no moral authority whatever on the issue of human rights.